Winter is in full swing, even in southern California. While it’s not nearly as frigid as other parts of the country, our winters are chilly and dry….bone dry. So how do we keep our skin from feeling itchy, red, cracked, and irritated? Oh, we have a few tricks up our sleeve! Unfortunately for a lot of us who enjoy really hot showers, one of the best ways to keep your skin from drying out in the winter is to turn down the heat (bummer!). Bathing in hot water actually leaches moisture from your skin when it evaporates leaving skin extra itchy and dry feeling. To combat this, turn down the heat a bit or at least make your showers shorter. If this is out of the question, try step #2. If you’re a fan of hot showers and can’t stand the thought of shortening or cooling them down, consider using a body oil to help seal in moisture. Using an oil while in the shower is even better because it will really have a chance to soak in and help soothe and heal dry cracked skin. Of course, you apply the oil after getting out of the shower, just be sure to apply it soon after getting out before your skin dries completely. Some of my favorites include almond oil , avocado oil , and coconut oil. All of these oils are super moisturizing and leave your skin feeling soft and looking radiant! When you’re done showering, take care not to towel off the oil too much. If done right, you won’t need any body lotion afterwards. I get my favorite coconut oil here. One of the best ways to keep skin looking and feeling smooth is frequent exfoliation. Exfoliation relieves the body of excess dry skin by removing the dead skin cells from the surface. Doing this regularly will prevent clogged pores, will keep skin feeling smooth and refreshed, and prevent your skin from looking dull. When I exfoliate, I like to dry brush my skin first before hopping in the shower. Doing this improves circulation, drains the lymphatic system, and allows body oils and other moisturizers to penetrate skin more effectively. Once in the shower I love using an exfoliating cloth (great for preventing ingrown hairs or clogged pores!) and once in a while a nice sugar or salt scrub. I recommend exfoliating at least twice per week for best results. You may need to exfoliate more or less often depending on climate, skin type, and sensitivity. I have enjoyed making this scrub recipe to keep my skin smooth all winter! Using a humidifier in your home or even just boiling some water over the stove can really make a difference for chapped skin. Since the air during the winter is colder and drier, skin is unable to stay as moisturized as it can when it’s warmer. A humidifier can mimic these warmer conditions, making the air less dry and less harsh for skin during the cold winter months. Since I began running my humidifier at night, my skin feels amazingly supple even without a moisturizer. Not only that, it also keeps my sinuses irritation free which is a big plus for someone who has chronic hay fever. When you wake up in the morning, your skin will feel more hydrated, more supple, and your lips less chapped. To those of us with cold constitutions, drinking a lot of fluids during the winter doesn’t always sound appealing. I always feel extra cold when drinking anything other than hot tea, but I know that I have to get some meaningful H2O too. At times, I’ve even let myself become dehydrated because I dread drinking anything below room temperature. When this happens I have to force down cup fulls of water…it’s really unpleasant…so yeah, I have issues with drinking water. But all you normal people out there, getting an extra glass or 2 of water should be easy enough. Since the body is largely made up of water, staying hydrated is really important to keep our body systems working smoothly. Without enough H2O we start getting headaches, feel woozy, get cotton mouth, dry eyes, and of course, dry skin. Water is so easily lost in our everyday activities too, even when we are asleep just from breathing. During the winter we lose water even faster! To help replace what we lose we need to stay hydrated by drinking enough water and eating foods that are rich in water content like juicy fruits and vegetables. You can even add a small pinch of sea salt (I use this sea salt ) to your daily water to help you absorb more of it. Once you find out what your daily need is, stick with it and feel the difference! No more dry cracked hands, feet, or lips! Lat but not least, don’t strip your skin during the winter with soaps that are meant for summer weather. Chances are, you’re not getting sweaty and grimy and your skin will be producing less oil than it does when it’s hot. Unfortunately, using the same soap all year long won’t give you the best results so you may need to switch to a gentler more moisturizing soap. I recommend using bar soaps during the winter because they lack certain chemicals that liquid soaps need to stay emulsified. These chemicals can be irritating and drying. I recommend this bar soap or you can make your own homemade soap. Topping up your intake of healthy fats like fish oil, cod liver oil (fermented is best! ), avocado, coconut oil, nuts, and seeds will feed your skin, bring down redness and inflammation, and keep it nourished and supple. 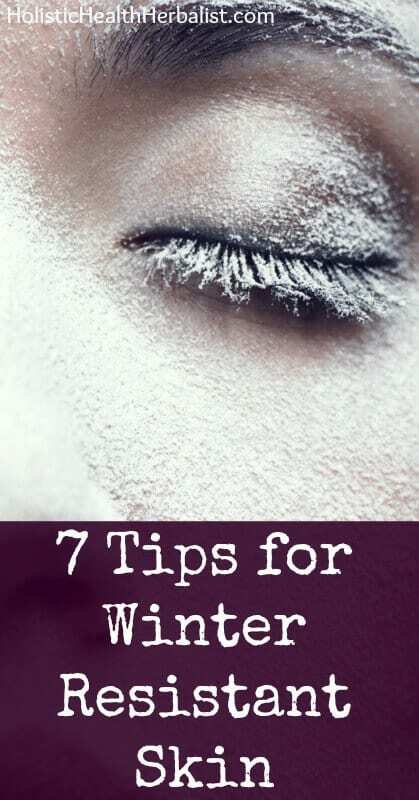 Your skin will become more resistant to cold dry weather, retaining more moisture, staying smoother, and looking more radiant. I take at least 2 of these daily. What have been some of your secrets for winter resistant skin? Why not just drink warm/hot water if you don’t like cold water? Ayurveda teaches that sipping warm water throughout the day is the best way to hydrate.